I got this neat calendar for the kids. 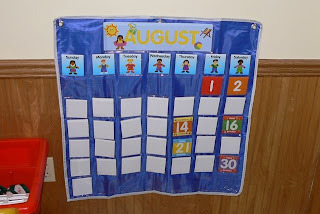 We have started talking about the months of the year, weeks, days, etc. Each morning we have gone into the kitchen and they have told me the month, turned around the next number for today’s date and then told me the day of the week. The number down further that are already turned around are days we are looking forward to. August 30 – Bubba turns 3!!! And there you go. . . He would love another birthday! Just an excuse for a party and presents. Plus, his comes right after Christmas so he’s needy about this time of year.